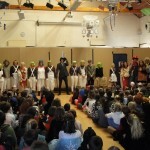 Today is WORLD BOOK DAY and the school is full of amazing costumes, inspired by book characters! 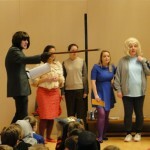 To begin the day, pupils were treated to a very special performance of ‘Charlie and the Chocolate Factory’ – the classic story by Roadl Dahl – by the teachers and TAs! 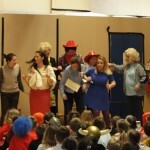 What did you think of the staff pantomime? Who was your favourite character? Which child’s World Book Day costume has really impressed you? (remember, no surnames). The play was just great. 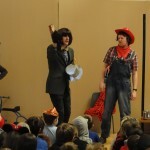 I did not go to the school pantomime but that made up for missing it. 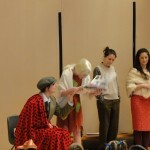 This staff pantomime was great and sooo funny. When I looked around the hall everyone was smiling and joined in with the fun. 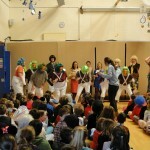 I thought it was amazing seing the teachers and T.A’s dressed up as characters. My favorite was Mr slatery as mike teavee.He was very funny. 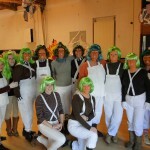 I also LOVED the T.A-ompa loompas because they were COOL!